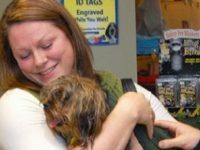 When I saw this post, the Oregon Humane Society breaks Adoption Record, I had to check it out and I know you will too. It’s heartwarming to see an agency really good at what they do. Do the math on this folks, 11,000 pets adopted divided by working days in a year including Saturdays is somewhere around 37 to 38 pets a day. How do they do that? Our congratulations to the Oregon Humane Society for a job well done. Now write a manual so others can follow your lead. dog was Mason, a three-year-old Yorkshire terrier who was adopted by the Bettineski family of Milwaukie. Mason came to OHS from the Curry Country Animal Shelter in Gold Beach. Mason is one of about 3,500 animals that OHS accepted this year from shelters in Oregon, Washington and California as part of the OHS Second Chance program. This year’s record breaks a record set last year, when OHS found homes for 10,113 pets — the first time that level had been reached since the new shelter building opened in 2000. The large number of adoptions makes OHS one of the busiest shelters in the nation. OHS adopts more animals from its shelter on NE Columbia Blvd. than any other single shelter facility on the West coast. For those who can’t adopt an animal, OHS relies entirely on private donations. A tax deductible donation can be made on the OHS Website at www.oregonhumane.org. Congratulations and a big thank you to the Oregon Humane Society. PS: If you are looking for a dog crate or a heavy duty dog crate for your little dog or for your strong dog we have them all over at Carry My Dog.com so give us a visit and take a look. The heavy duty dog crate is a tool to help manage dogs, especially some rescue dogs, with separation anxiety, noise phobia and much more. I hope this post lets you know that it can be done as demonstrated here with Oregon Humane Society breaks Adoption Record so anytime people say that it can’t be done refer them to this post or they could just ask Mason. This is just way too cool. I wonder what the target is for 2011?